183 Commonwealth is located on the north side of Commonwealth, between Dartmouth and Exeter, with 181 Commonwealth to the east and 191 Commonwealth to the west. 183 Commonwealth was designed by Snell and Gregerson, architects, and built ca. 1878 as the home of Frank Merriam and his wife, Teresa Beatrice (Lovering) Merriam, on land he purchased from the Commonwealth of Massachusetts on March 7, 1878. They previously had lived 227 Beacon. They also maintained a home, the White House, in Nahant. Click here for an index to the deeds for 183 Commonwealth. Frank Merriam was a trustee of estates and an agent for various properties. During the 1884-1885 winter season, the Merriams were living elsewhere and it was the home of William Eliot Sparks and his wife, Harriet Augusta (Mason) Sparks. Their primary home was in Taunton, where he was associated with his father-in-law’s machine works. By the 1885-1886 season, they had moved to 245 Commonwealth. The Merriams were again living at 183 Commonwealth again for the 1885-1886 and 1887-1888 winter seasons, but during the next season it was the home of Robert Chamblet Hooper and his wife, Helen Angier (Ames) Hooper. They had lived at 244 Beacon during the previous season. Robert Chamblet Hooper was treasurer and later president of the Constitution Wharf Company. A noted dog fancier, he was owner of “Judge” (also known as “Hooper’s Judge”), credited as the ancestor of the Boston Terrier breed. The Hoopers moved to 40 Hereford for the 1889-1890 winter season, and then to the new home they had built at 448 Beacon. During the 1889-1890 winter season, the Merriams were once again living at 183 Commonwealth, but during the 1890-1891 season it was the home of Asa Perkins Potter and his wife, Delle (Sheldon) Potter. They previously had lived at 29 Fairfield. Asa Potter was a real estate investor and banker, president and one of the principal owners of the Maverick National Bank. In October of 1891, the bank failed and Asa Potter, Jonas H. French (the other principal owner), and Thomas Dana (another director) faced criminal charges, accused of violating federal banking laws. The Potters moved to the Longwood neighborhood of Brookline by 1892. They subsequently moved to New York City and then to Rye, New York. The Merriams resumed living at 183 Commonwealth until the 1893-1894 winter season, when they moved to 10 Marlborough and 183 Commonwealth was the home of George Augustus Nickerson and his wife, Ellen Floyd (Touzalin) Nickerson. He was president of Arlington Mills, textile manufacturers. They also maintained a home in Dedham. They moved the next year to a new Boston home they had built at 303 Commonwealth. During the 1894-1895 winter season, the Merriams were living at 183 Commonwealth again, but during the 1895-1896 season it was the home of Mr. and Mrs. F. L. Gay, probably Frederick Lewis Gay and his wife, Josephine (Spencer) Gay, whose usual home was in Brookline. By the 1896-1897 winter season, the Merriams had resumed living at 183 Commonwealth and continued to do so until about 1900. During the 1900-1901 winter season, it was the home of Mr. and Mrs. George L. Draper. The Merriams resumed living there during the 1901-1902 winter season, and continued to live there through the 1902-1903 season, after which they traveled abroad once again. During the 1903-1904 and 1904-1905 winter seasons, 183 Commonwealth was the home of ornithologist John Eliot Thayer and his wife, Evelyn Duncan (Forbes) Thayer. They also maintained a home in South Lancaster. They had moved from 183 Commonwealth by the 1905-1906 season, and by the 1907-1908 season were living at 173 Commonwealth. By the 1905-1906 winter season, the Merriams were living at 183 Commonwealth once again and continued to do so for the rest of their lives. Frank Merriam died in April of 1924. 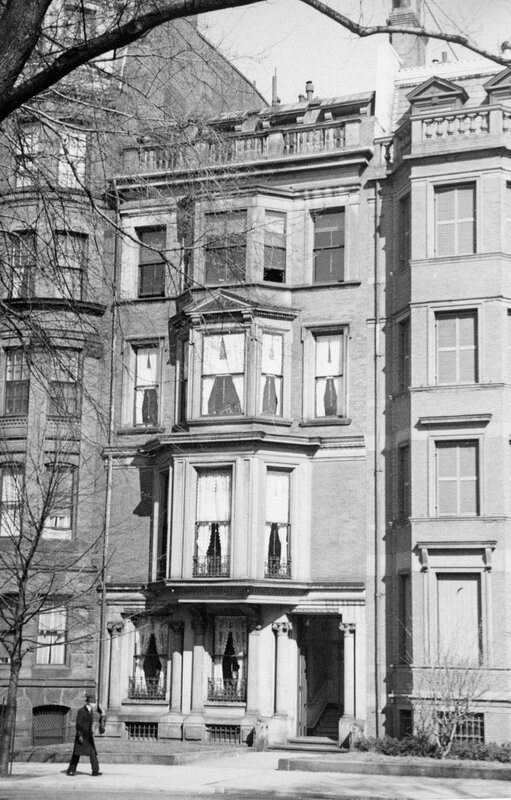 Teresa Merriam continued to live at 183 Commonwealth until her death in April of 1936. In her will, she left 183 Commonwealth to their daughter, Teresa Lovering Merriam, who had lived with her, and divided the remainder of her estate between Teresa and her other daughter, Mary Lovering Merriam, who lived in San Diego. Teresa Merriam continued to live at 183 Commonwealth and in Nahant until about 1943. On August 19, 1943, 283 Commonwealth was purchased from Teresa Merriam by William Karmazine, a loan company executive, as trustee of the Esdith Realty Trust, and on September 7, 1943, it was acquired from him by Bernard J. Killion. 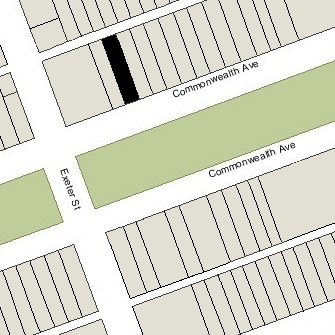 183 Commonwealth was shown as vacant in the 1944 and 1945 City Directories. On April 4, 1945, 183 Commonwealth was acquired from Bernard Killion by Einar Anderson. In May of 1945, he filed for (and subsequently received) permission to convert the property from a single-family dwelling into nine apartments. On August 7, 1945, 183 Commonwealth was acquired from Einar Anderson by Beatrice (Miller) Silversmith, the wife of Peter P. Silversmith. He was a lawyer, hotel operator, and real estate dealer. 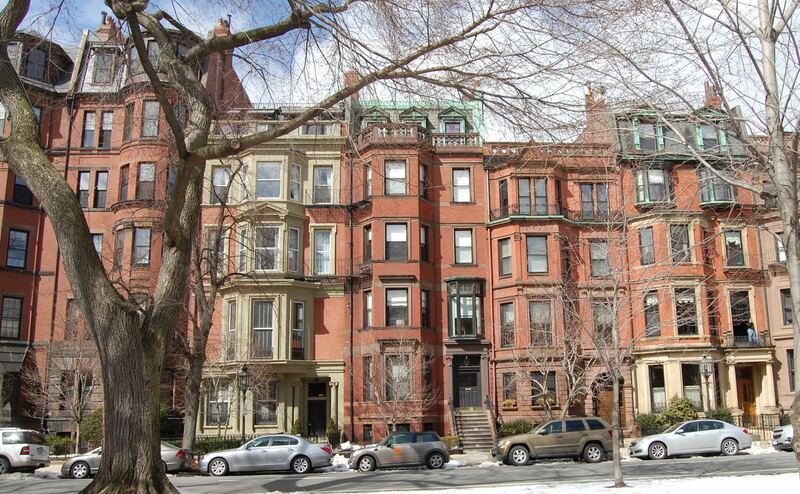 They lived in Brookline and later in an apartment at 62 Commonwealth. On July 19, 1960, Beatrice Silversmith transferred 183 Commonwealth to herself and her husband as trustees of The Peter P. Silversmith Trust. Peter Petritis died in April of 1967, and on June 8, 1967, 183 Commonwealth was purchased from Phyllis Lee (Fawcett) Petritis (his widow) and William Coltin, trustees of the Paul-Pet Realty Trust, by Abbot M. Peterson, III, and his wife, Barbara E. (Pease) Peterson. They lived in an apartment at 464 Beacon. The Petersons also purchased 55 Commonwealth from the Paul-Pet Realty Trust on the same day. On April 16, 1985, 183 Commonwealth was purchased from the Petersons by the 183 Commonwealth Development Corporation (Robert M. Barsamian, president; Lisa P. Barsamian, treasurer). In June of 1985, it filed for (and subsequently received) permission to reduce the number of units from eleven to five, and in April of 1986, it filed for (and subsequently received) permission to increase the number of units to six. 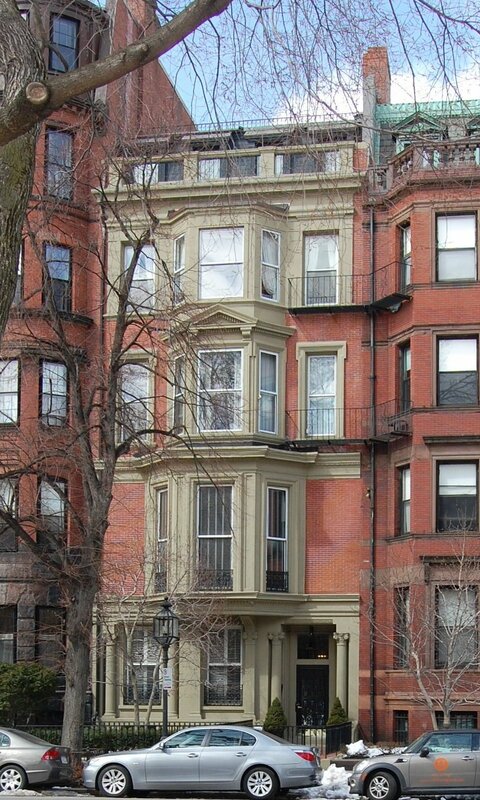 On April 11, 1986, it converted the property into six condominium units, The 183 Commonwealth Avenue Condominium.